The tires and wheels you choose for your Jeep, truck, or 4-wheel drive are vital to its performance both on the street and on mud, dirt, snow, and in what we call non-standard driving conditions. However, with all of the choices out there, how do you decide what kind of tire to choose? The answer is, like many other automotive questions, it depends. The key is to determine where you spend most of your time driving. Are you on the street or off-road most of the time? Do you do some of both? In the case of wheels and tires, the differences are so significant that if you do some of both, you may want to keep two sets of tires and wheels, one for each purpose. What are the types of tires and wheels, and how do they perform? Here are some answers. They each have pros and cons and work well in different conditions. There’s also a cost difference. Here’s how it breaks down. Steel wheels are the cheapest kind you can buy. They’re heavy workhorses, hard to damage and in most cases, easily repaired. Because they’re heavy, you do sacrifice some agility and strength, but you do gain something called unsprung weight. Unsprung weight is the weight not carried by your suspension. While not the most desirable on the street, unsprung weight is almost always desirable off-road as it helps the vehicle stick to the road and really power through mud, snow, and overcome obstacles. Steel wheels are considered the best by many aficionados of 4-wheel drive vehicles. Both their weight and cost are considered assets in this case. These are the second least expensive type of wheels and are formed by combining aluminum and another substance to make them stronger. Cast wheels are formed by pouring liquid metal into a mold. While they’re pretty lightweight and inexpensive, they’re also weaker than steel wheels. Their lightweight nature makes them great for the street, promoting speed and agility, but they’re also easily damaged. This makes them much less desirable for off-road adventures, as they’re also expensive to repair. Much of the time, if damaged severely enough, they’ll have to be replaced. Cast aluminum is considered the least desirable for 4-wheel drives in non-standard driving conditions, but the cost makes them an affordable second set of wheels if you’re going to have one set for street and one for the weekend. These wheels are often considered to be the best of both worlds. Forged alloy is made through the application of heat and pressure, making them nearly as strong as steel but remaining lightweight. They have both strength and offer speed and agility, while costing about the same to fix as steel wheels. The biggest drawback is cost: these are the most expensive wheels and don’t offer the same unsprung weight benefits as steel. However, if you’re looking for a single set of wheels that offers the best of both worlds, forged alloy is well worth considering. The wheels you choose are just step one though. Then you need to put tires on them. The type of tires you purchase are affected by a few different factors. They include tread and tread depth, ply, and tire pressure ratings. 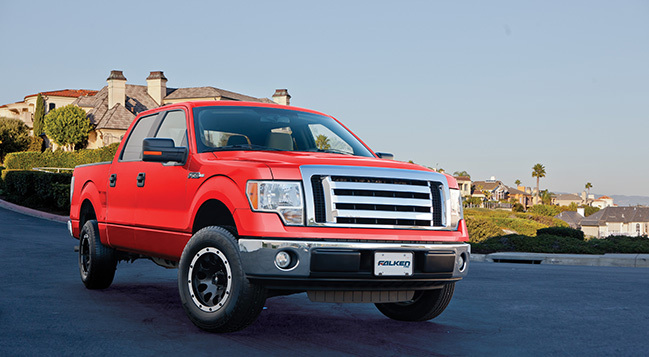 The essential choices are highway/all terrain tires and more aggressive off-road varieties. To understand the difference, we need to look at how each performs in conditions they weren’t designed for. To keep things simple, we’ll just say that highway all-season tires start to fail quickly when taken much beyond some simple gravel roads or going up and down your local boat ramp. If you spend most of your time on paved roads, something around 70-80% or more, these tires may work for you, but you’ll have to use caution off road. Standard (not off-road) tires are often 4-ply. This is enough to keep your truck stable on the road, while offering flexibility, comfort, cornering and agility. However, 4-ply tires are more likely to be punctured or damaged by sharp rocks, sticks and other hazards often encountered off road. If you hit a hard bump, you’re more likely to have rim contact, potentially causing wheel damage. On the highway, these tires offer lower rolling resistance for better fuel economy, less road noise, and good grip in most normal conditions like rain and snow. Venture off the pavement though, and you can encounter issues. Have a set of off-road tires that are 10-ply and plenty tough for mud, gravel, rock, and even deep snow? They far it’s is a different story. First, there’s the problem of rolling resistance and road noise. You’re going to experience lower fuel economy simply because it takes more power to move the grippier, heavier tires down the road. Resistance to slippage also results in resistance to rolling. These tires also make more noise due to the deeper tread when on the highway at speed. This often becomes a howl, something that can really disrupt your driving experience, especially if you spend a lot of time on paved roads. Bottom line? It depends on where you drive. Spend most of your time on the street, and very little in severe off-road conditions? Stick with street tires and wheels that will better meet your needs. Spend more time climbing rocks and mudding? Choose an off-road combination of wheels and tires that fits how you drive. Do some of both? You may want to consider two sets of tires and wheels, one for during the week on the street and the other to power your weekend fun.